Keeping abreast of what’s happening the marketing industry—especially digital and social media marketing—is important for any business. But if your business is marketing, it’s essential, and if your clients are small businesses, you need a constant stream of new ideas and inspiration. Because small businesses have limited time and often limited resources, you have to find ways to be creative, clever and innovative to improve their customer experience. With so much noise out there, that can seem like a tough mountain to scale. Not to worry! You can find plenty of inspiration from others online (for free!). Reading blogs that talk about how other agencies, as well as big and small business, are innovating in the marketing space, as well as staying on top of recent surveys, analyses of new survey data, new industry trends and strategies, are important in order to keep your finger on the pulse of the rapidly evolving marketing industry. No matter how experienced you are, the only way to stay relevant is to read. This blog has been a staple of the advertising game for years. It’s an image-driven blog featuring all kinds of ground-breaking ads on a variety of media: television, social media, print and radio, and the stories behind them. Adland has an impressive library of ads from the past as well as what appears to be an archive of every Super Bowl commercial ever made. If you’re looking for inspiration or to see what other brands and agencies are doing, Adland is a solid place to start. 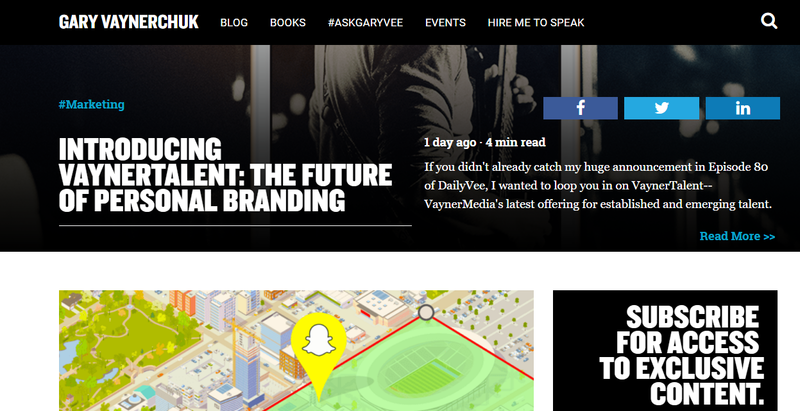 Vaynerchuk is a digital marketing guru (as well as a venture and angel investor) who builds businesses. His blog holds his thoughts on everything: how to use Snapchat, strategies or selling real estate, popular new apps, the nuances of negotiating, the importance of logos, the value of emotional intelligence (and everything in between). It’s a mash up of his opinions on the news, technology, social media innovations, and the nuts and bolts of marketing and entrepreneurship. It’s a must-read if you’re looking for variety and years of experience. 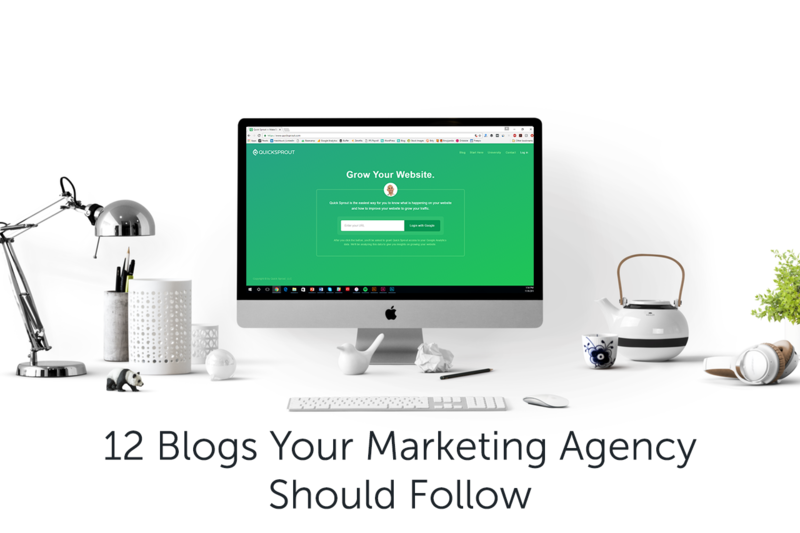 This blog covers the ins and outs of digital marketing campaigns, giving you smart information and an insanely thorough, wide-ranging downloadable catalog of infographics and guides. The blog covers all things measurable—and how that data is impacting various aspects of marketing—like customer loyalty programs, A/B testing, traffic and lead generation, omni-channel marketing…you get the idea. As loyal Kissmetrics users, we can’t recommend this one enough! Reading MarketingProfs regularly is sure to make you feel like a marketing master. The blog educates readers about everything related to content and digital marketing, and offers real-world solutions to all kinds of marketing challenges. MarketingProfs also keeps readers abreast of emerging trends in the industry. Contributors are experts, screened for expertise in particular areas. There’s no shortage of free content on the site including marketing articles, email newsletters, discussion forums, sponsored seminars and virtual conferences. For $279 a year, you get access to a treasure trove of marketing information, including webcasts, special reports and interactive toolkits. This site is all about finding creative inspiration, specifically for advertising, design and film industries. It offers small write-ups of clever, advertising across all types of media. The site, which was established in 2006 by Stephen Molloy, is sleek and easy to navigate. Articles are based on submissions sent to the blog from agencies, production houses, photographers, sound and music companies and PR firms. In addition, the folks behind it do some original reporting on stories they deem worth promotion. Although it’s really more of an online publication than a blog, Search Engine Land provides detailed and useful information about the search marketing industry, and that’s so much more than just SEO. Recent stories/posts include coverage of Google at SMX East 2016, why call tracking helps improve paid-per-click campaigns and a guide to how Google handles duplicate content. If your agency helps small businesses maximize search traffic, Search Engine Land is a necessity for your reading list. The Examiner bills itself as the world’s largest social media marketing resources and its readers will find articles, expert interviews, reviews of the latest industry research, original news and more. Social Media Examiner even boasts it own podcasts covering everything social media related. The site attracts more than half a million email subscribers. Clark is a marketing strategy consultant who has authored articles for sites such as Harvard Business Review, Time, Entrepreneur and the World Economic Forum blog. She has schooled a wide range of clients, including executives at Google, Microsoft, Morgan Stanley and others. Her blog is not only well-designed and interesting, it’s well written—it’s clear that Clark is an award-winning journalist. The blog offers interesting morsels of information and stories that aim to help readers build the kind of marketing voice that enables them to be seen as a thought leader in their industry, and if they do it right, beyond. One of the most progressive content marketing blogs out there, Story Needle has gained popularity simply for its emphasis on that old stand-by: good storytelling. Because what is content, after all, if not telling a story? Story Needle is written by Michael Andrews, a content strategist and former manager of content strategy at Sapient. 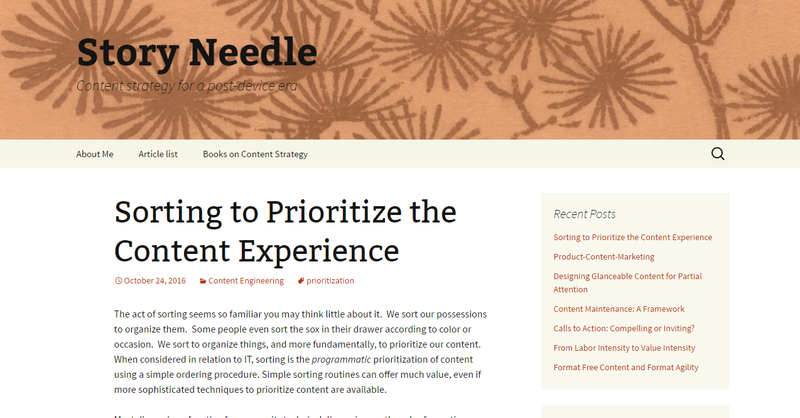 His blog parses content strategy in ways that make sense, discussing relevance, personalization, adaptive content, design, user experience and more. 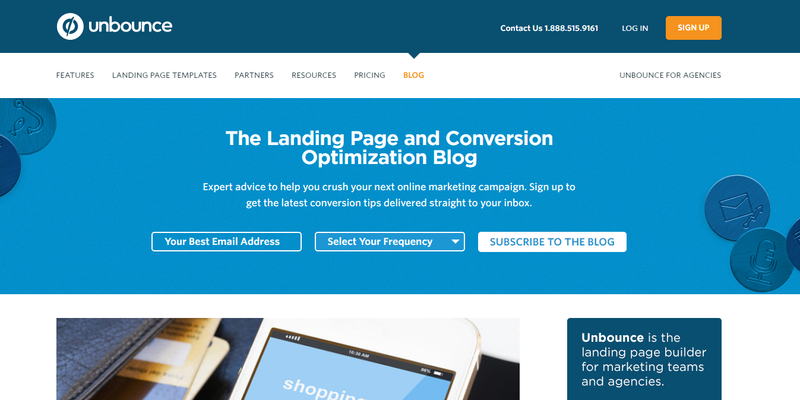 Unbounce is all about optimizing website landing pages so that they collect and convert leads and increase conversions. The posts are chock full of data and very actionable advice. For instance, recent posts included information about Google Map’s promoted pins, and 36 landing page design examples and critiques of them and a 50-point checklist for your landing page. Sure, maybe this seems obvious but sometimes we don’t see the what’s right in front of us. No doubt you and your clients are using Google AdWords, so keeping up with their latest news, user tips and general information on better ways to make use the tool is important. Each blog post is a like a mini-tutorial on different aspects of Adwords, like remarketing lists for search ads or their Customer Match feature.